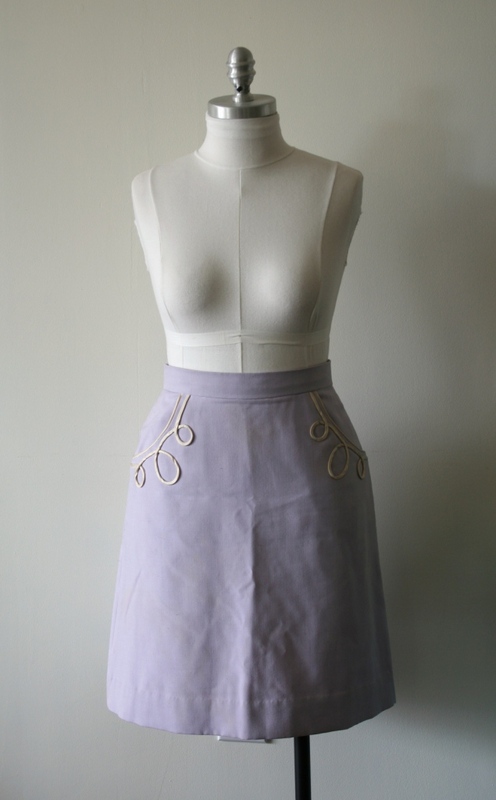 This lavender one and the yellow skirt below are both made from wool pieces I picked up at Goodwill or Value Village. 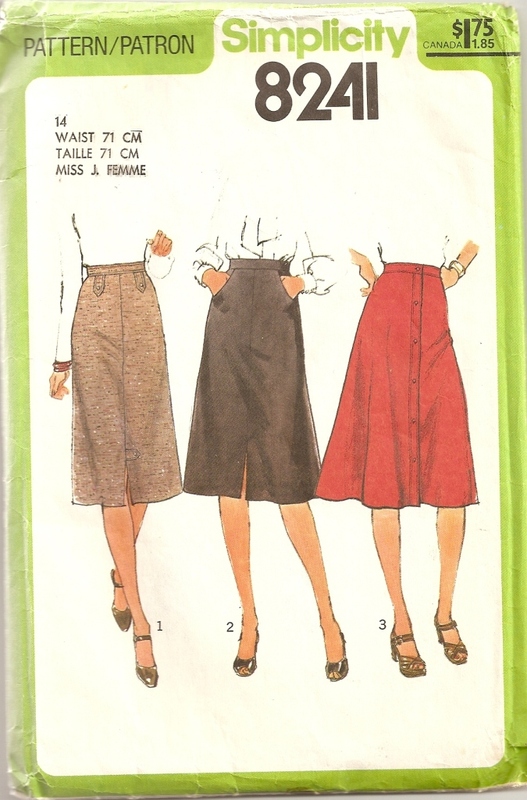 There was just enough of each for an A-line skirt. The decoration around the pockets came from a combination of two tutorial on the Colette Patterns blog . This technique mashed up with this design idea. 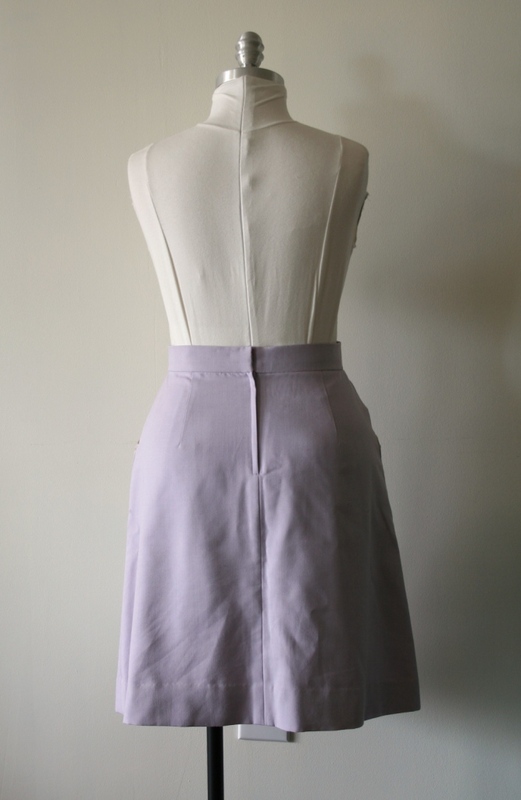 This skirt is lined with a mauve silk jacquard I had in the stash and was never going to use for a garment because I wasn’t keen on the jacquard pattern. The buttons are these funky vintage dome buttons I found sometime at the Sunday St Lawrence Antique Market in downtown Toronto. They remind me of beehives! Below is probably one of the most luxurious pieces of everyday wear I own. It’s made of wool satin. I got it for a great deal somewhere online back in 2008. It was purchased to make this. I had to take the 3 yd piece, but only needed about 1/2 yd/m for the stays. So there was lots left over for a pretty dress! You can tell that I was still into the swirly rouleaux trimming when I made this ;o) Hmmm….I should try it again sometime, it’s a pretty cool technique, isn’t it? 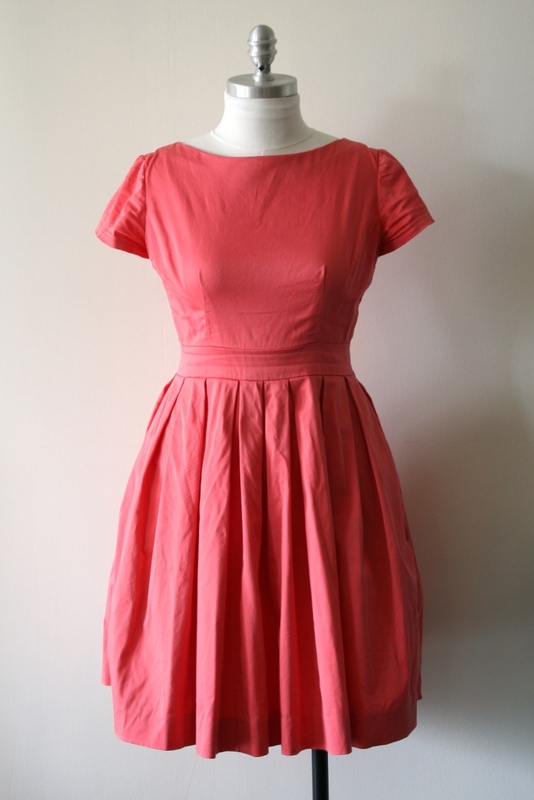 The dress below is lined the same way as the pink one above. I did a little better and more fun on the fabrics, though. 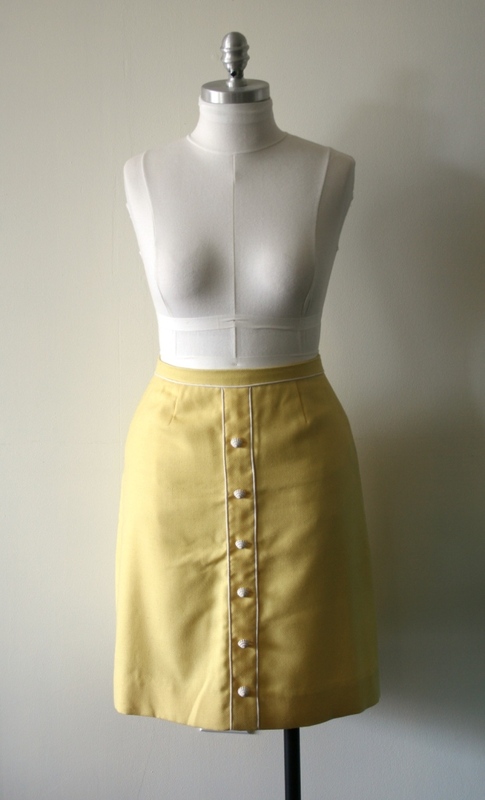 The skirt is lined with solid light green bemberg and the bodice with a cute little green on white cotton print. 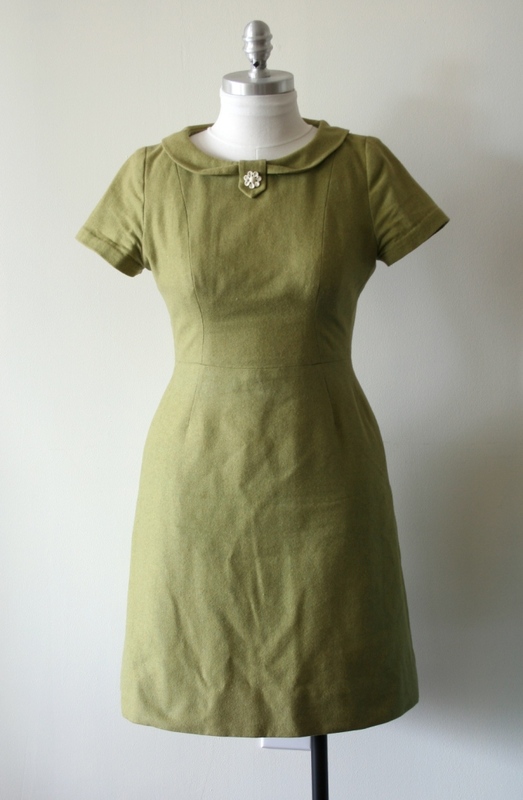 This dress is made from a wool blend of some kind. I found it at Fabricland on one of their ‘designer ends’ tables, so it was invariably labelled “100% unknown fibres”. There’s definitely wool in there, though. It’s warm, it presses and steams well, and smells like wool when wet. Oh shoot, I should’ve photographed it with a belt, I usually wear it with a white one that really sets off the fun button on the collar tab. 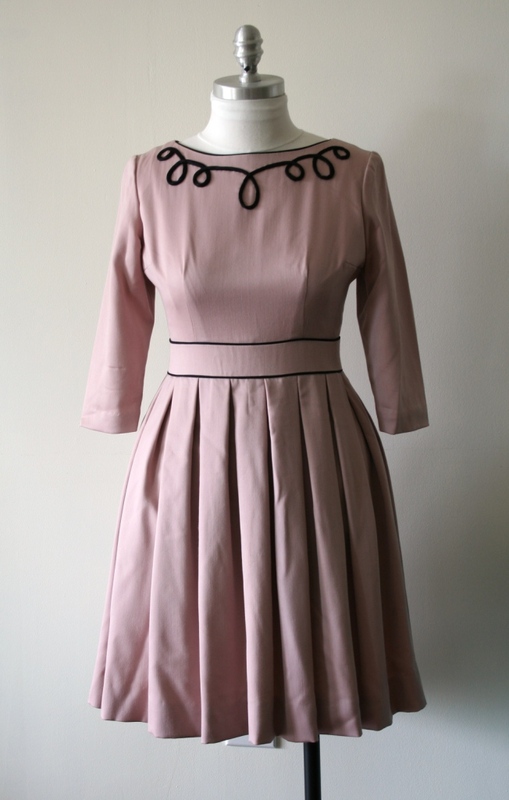 The dress below is for more of the “spring is a real possibility” phase of this transitional time. It’s made from stretch cotton sateen and I really should have pressed it before photographing it. Anyway, it’s unlined and until June will be worn with a cardigan and until May (or, who knows, maybe June this year) with tights. To wear it with tights I wear a half-slip underneath it. I’m really into the idea of wearing slips rather than lining everything. I still only have one, but wear it ALL THE TIME through fall/winter/early spring. Wearing slips instead of lining everything saves both resources/money and time: win-win! Oh, and this also enables me to wear some warmer weather dresses and skirts during cooler times as it adds a little bit of warmth and makes them wearable over tights! 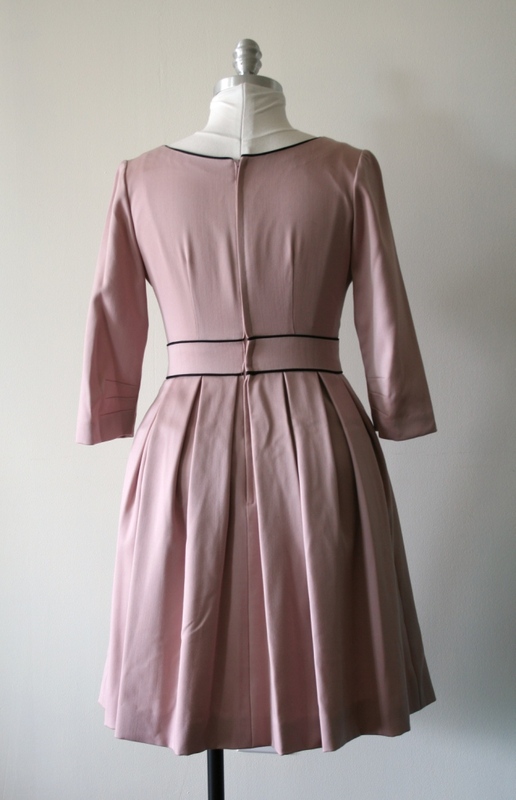 Oh – and this dress is another version of the “waistband fix” idea I mentioned above. Oh dear, so rumpled-looking. I swear this is really pretty when worn, I get lots of compliments on it. And it looks super smart with a black belt and accessories! I call this my “Chanel” skirt. Something about the black + cream + stripes makes me think Chanel-ish for some reason. 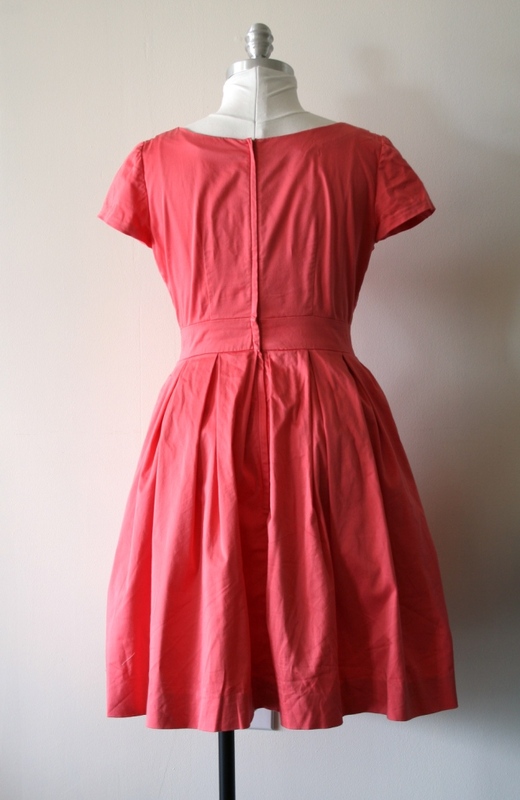 As opposed to the coral dress above, this is a mainly winter skirt that can segue into the transition to spring. 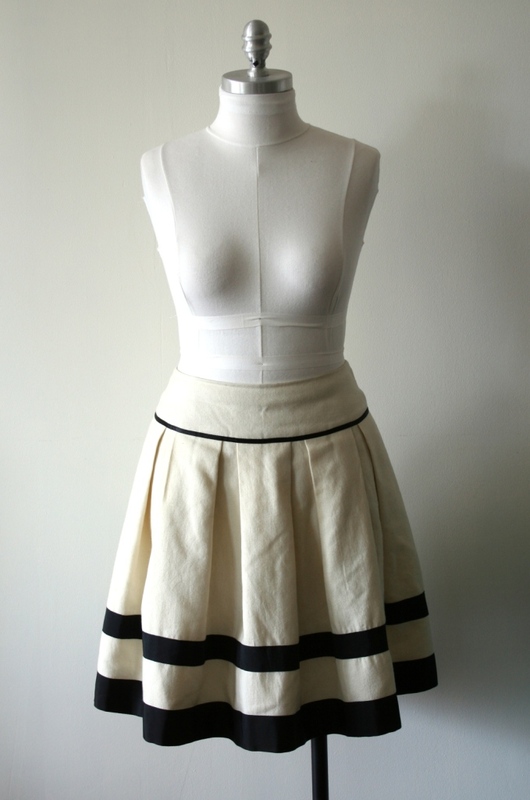 This skirt is made of a wool fabric called “Viyella” (although it was a random thrift-store find, it had a Viyella label affixed to it). I did a little research into the name and believe it was a popular fabric in the early 20th century for warm wool undergarments. It’s pretty soft to the touch and supposedly washable. I might have been willing to put that to the test, but the grosgrain ribbons that make up the stripes would shrink like crazy, being cotton/rayon. Trust me to make a washable wool garment unwashable! 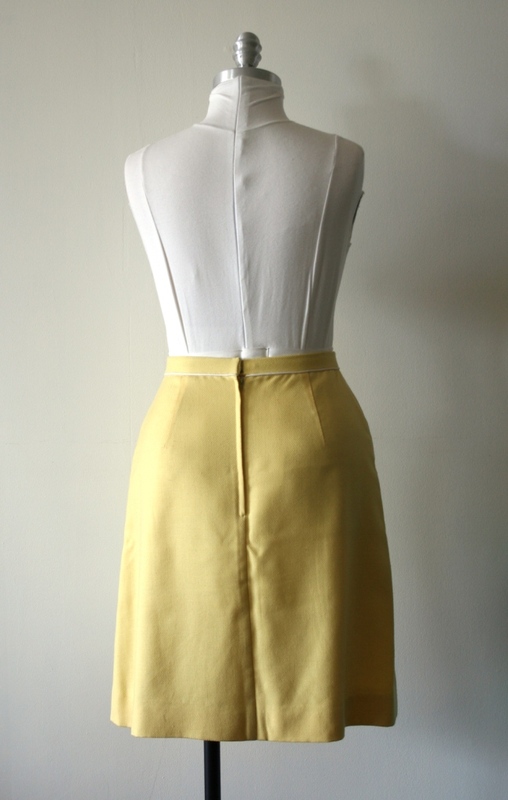 You can’t see it, but I lined this skirt with some leftover ivory satin lining. The lining has some body to it, though it’s not kasha lining (satin face, flannel back) which adds substance to the skirt, and makes it super slippy on the inside! (I don’t know what it’s fibre content is, adding to the unwashability). These two dresses are last year’s additions. This one is made from a medium weight cotton something (I found it in a drapery section) trimmed with ivory cotton bias binding. It’s unlined and I often wear it with a little cardigan over top, my full-ish half slip under it and the ubiquitous tights. 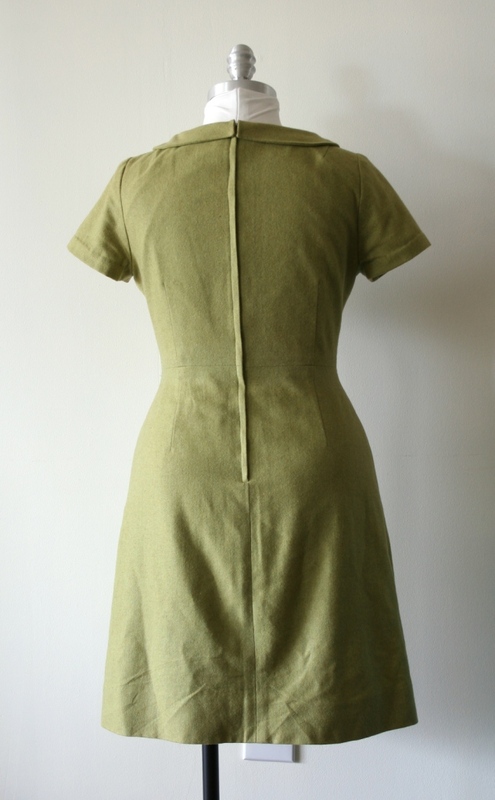 There’s a little hook and thread loop to fasten the waist trim over the zipper! Below is my first Macaron from (I hardly need say) Colette Patterns. To be honest, I wasn’t in love with this dress when I first finished it, but it’s steadily growing on me. It’s made from a green/blue windowpane check that I think is one of those raw silk suiting type fabrics. Maybe mixed with linen? Maybe not. I found it *somewhere* years and years ago. The blue contrast is a remnant piece of wool (gabardine, maybe?) left over from a suit I made in 2009 to wear to my MA thesis defense (I need to find occasion to wear that suit again – it has piped welt pockets!). 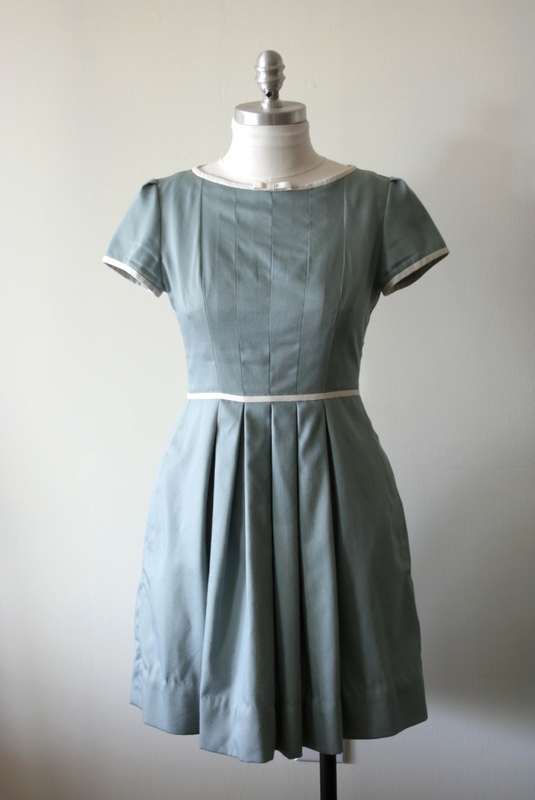 I lined the bodice of this with blue cotton (leftover from some experimental dyeing of a thrift store bedsheet). I left the skirt unlined and wear the half slip with it. I think I need to make some summer Macarons! This is Vogue 1317 by some guy designer named Ralph Rucci. Upon closer inspection of the pattern I discovered that the front is actually vented and there are pockets in the side front seams. I’m going to eliminate both of those and alter the pattern to have just a normal side front seam. As much as I love pockets, adding bulk right over that area on a style that’s kind of fitted through the hips is just not going to look good on me. The design of the pattern also eats up just a little more fabric than I’ve got, so doing this will also mean I have enough fabric for it. 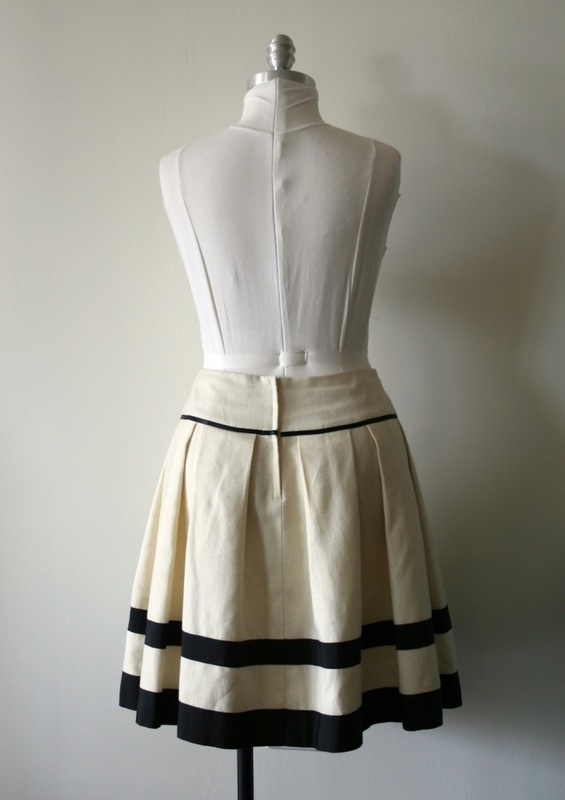 (I initially considered doing the tie and back waistband in a contrast colour, which I think could look great, but for this one I just prefer monochrome). 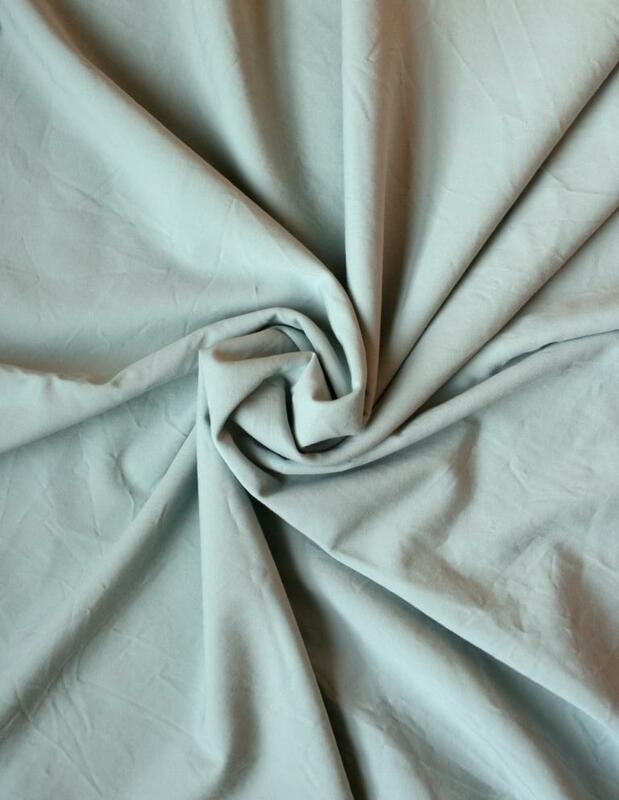 My fabric is this wool blend from a store in Toronto. Hey, they have a FB page! Although it’s a blend, it really smells wool-y, so I think there may be only a little of something else. So that’s the bulk of my “Canadian Spring” wardrobe, which gets interspersed with more wintry clothes until the temp gets above about 10C when it’s interspersed with more spring-y clothes, lol. How have you adapted your sewing to the needs of your climate – if you need to? p.s Thank you so much for all the lovely comments and compliments on my Tree gown. I loved sharing it with people who can appreciate the monstrous amount of work it took, lol. And I have to say I was a little surprised at just how much love the cape got! Photos from our “photoshoot” are hopefully coming soon! « Jimminy Crispies! There’s a Charles James Gown in my living room!! Oh my gosh, how do you have any energy left after finishing that Charles James! I agree that transitional fabrics have gone out of favor; maybe because everyone’s bumming around in fleece? I just bought some gorgeous New Zealand merino jersey (at The Fabric Store in L.A.) to make some “three season” attire for New England. I don’t know how it is up there, but the buds are finally coming out in Boston! We don’t have buds on trees yet, but I was just out and there are crocuses and snowdrops up and blooming and shoots of tulips and/or daffodils coming up. Bits of green here and there, it’s very exciting! p.s. I’m jealous for your NZ merino wool jersey, I bet that stuff is divine. I just started following you today because of your tree gown. Gorgeous job by the way. I live in South Dakota and I LOVE your spring plans. Your spring sounds like our spring and I can’t believe I hadn’t thought of doing this yet. I love all your warm springy skirts and dresses. You’ve inspired me! Hello, thanks for stopping by! When I first thought of this whole spring-clothes-for-people-who-live-in-a-place-where-it’s-still-winter-in-March thing I couldn’t believe I hadn’t done so before. I’m so glad to hear this feels relevant for other people! 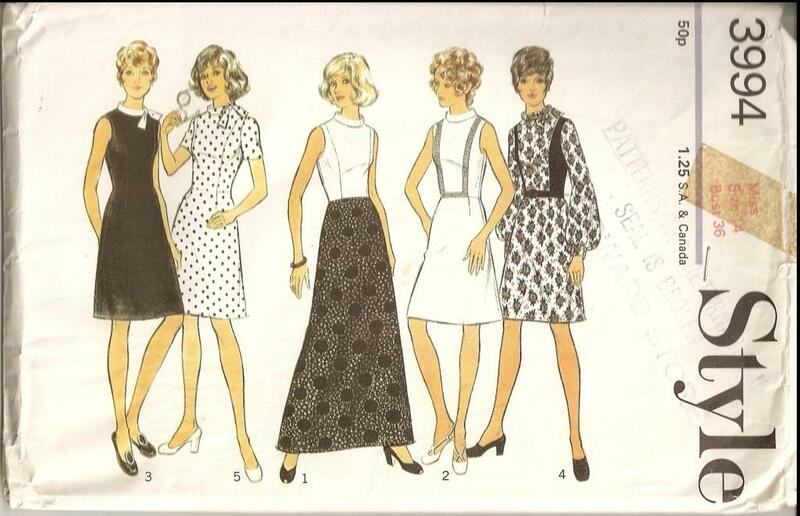 These dresses are fab! This is inky the end of my first year of dressmaking so at the moment I have summer dresses, winter separates and two cocktail dresses. Making clothes for spring and autumn is a great idea. I’m off to read your past posts. If the rest of your projects are this lovely, prepare for more praise! Oh my gosh I am so blown away by these creations! It feels like that “ahhh” moment when I find the PERFECT garment for me in a store, haha. I am so impressed and inspired by your color combinations and waistband finishes–what a positive difference they make! I think your spring wardrobe is the most beautiful I’ve seen! and I especially love the green dress. Divine! I’ve made that Ralph Rucci dress, and I have to say the pockets are wonderful and not really as bulky as all that. 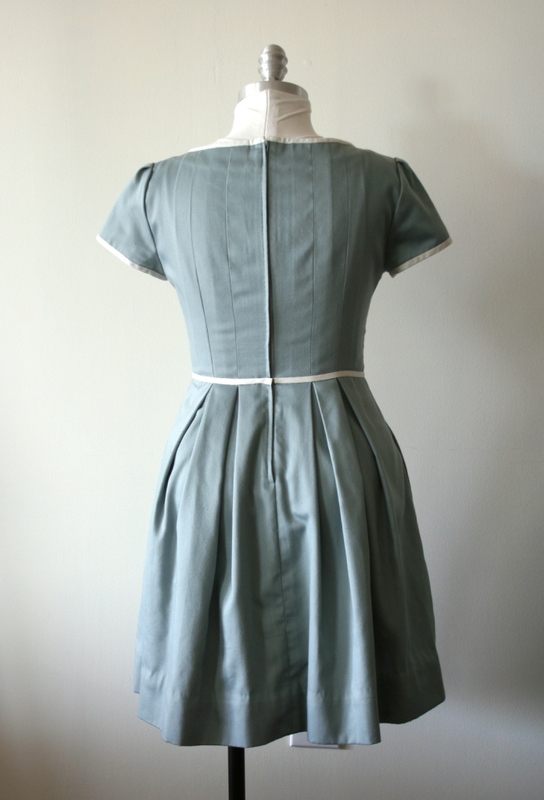 I altered by shifting the seam and pockets a little further away from the CF line. The skirt is quite roomy and “flippy” actually. Beware of those sleeves, I found it hard to lift my arms above my head.. I wore the dress but it was disappointing, the sleeves were such an issue. Thank you so much, Carolyn! And thank you also for the advice re the Ralph Rucci dress. My fabric has a teensy bit of stretch to it that I hope will help with movement, and I’ll see if there’s anything I can do to the pattern to improve it more. And maybe see if I can squeeze as-is pocketed version out of the fabric I’ve got. I live in the city of perpetual winter-Winterpeg (AKA Winnipeg) and I’m not gonna wear dresses or skirts yet. Too cold…even if they are wool. I like the dresses you have made though! Where there’s a will there’s a way! 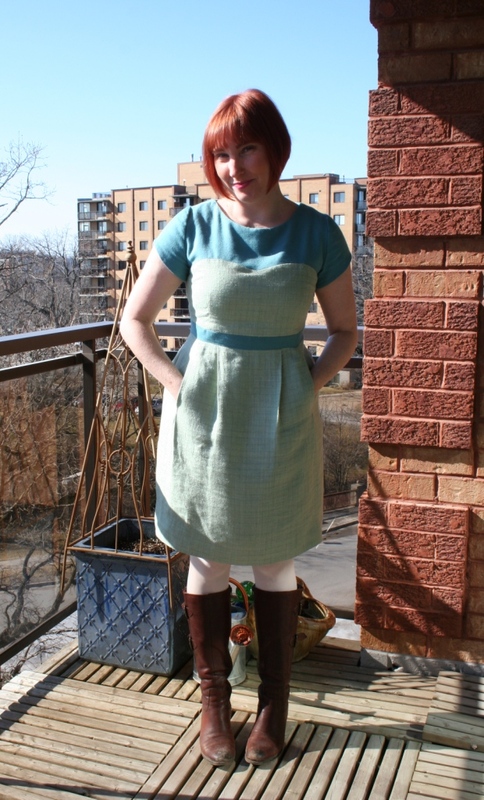 I spent several years in Edmonton for my MA and wore skirt & dresses through winter as often as pants! I just doubled up on the warm tights and added extra socks inside my boots, lol. But I feel for you! It is those cold updrafts…. *So* glad I stumbled upon your blog, what incredibly lovely pieces you made! I think your idea of using pastel colored winter fabrics is brilliant, keep up the good work!